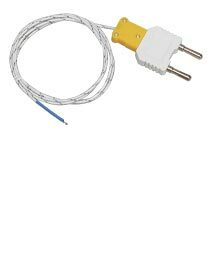 Use the TP873 type K thermocouple sensor with an appropriate Extech digital thermometer to measure gas and surface temperatures. Flexible wire, 39" long. Banana plug adaptor. Measuring range: -40 F to 482F (-40 C to 250C). Not for liquid imersion.